Today my recipe was featured on Martha Stewart's intsagram page (see below) and I got bombarded by questions about the recipe. The photo was featured as the winner of the #JustOnePot contest. I was so excited after finding out the news because I'm a huge fan of Martha and as the winner I will get a chance to meet her at the launch of her new cookbook, One Pot. I never gotten the opportunity to post this recipe on here and thought now would probably be a good time. 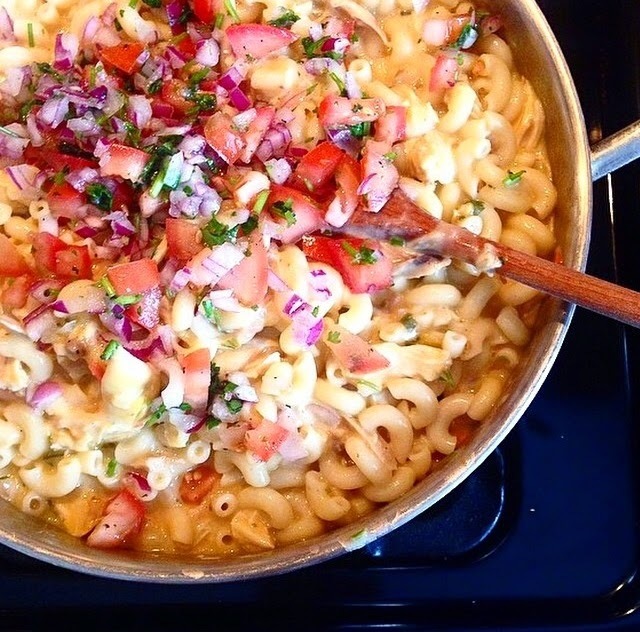 This is such a delicious recipe and very different from your ordinary mac-and-cheese. Hope you guys like it. Bring a large pot of salted water to a boil. Add the pasta and cook as the label directs. Drain, rinse under cold water and return to the pot. Toss with 1/4 cup milk. Top with the cheese and chicken (do not stir). Meanwhile, melt 1 tablespoon butter in a large skillet over medium-high heat. Add the scallions, chili powder, 1 teaspoon salt and pepper. Cook, stirring, 2 minutes. Add half of the pico de gallo. Cook, stirring, until the scallions soften, 2 to 3 minutes. Reduce the heat to medium. Add the remaining 2 tablespoons butter and melt. Sprinkle in the flour; cook, stirring, until a paste forms, about 1 minute. Gradually stir in the broth and the remaining 1 cup milk. Bring to a simmer; cook, stirring occasionally, until thick enough to coat the back of a spoon, about 6 minutes. Add the sauce to the pot with the pasta. Cook over medium heat, stirring, until the cheese melts, about 3 minutes; season with salt and pepper. Top with the remaining 1/2 cup pico de gallo. Please note: there are many ways of making this recipe. Make it to your liking. If making for kids only add 1 teaspoon of chili powder. Can you share your homemade pico recipe please? Thanks!